A stranger arrives at a lonely church on a rainswept hillside in the middle of the night. What true purpose hides behind his mask of friendship? I came late to this anthology, as I was finishing a novel while the bulk of writers were thrashing away at their keyboards. So when it came time to start developing a story, I asked the editors to send me a one-line pitch for each of the other stories so I didn’t waste time replicating a story that had already been written. 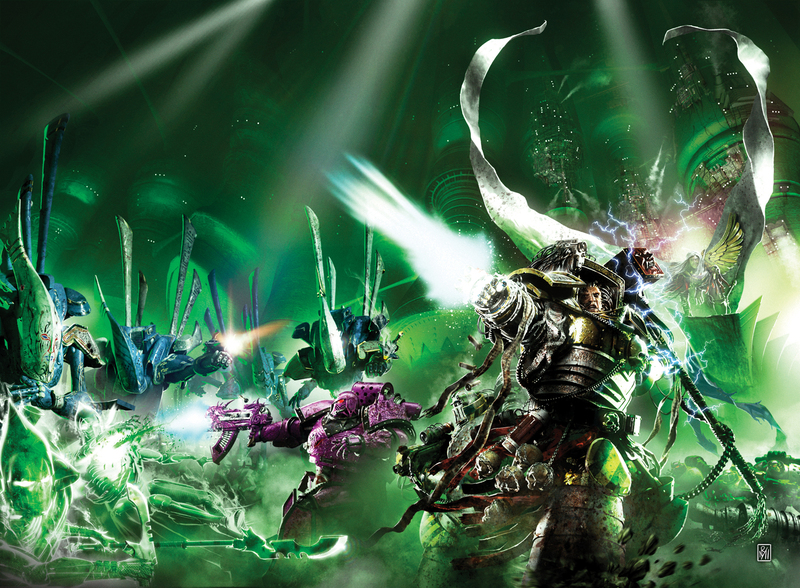 When I got them, they were mostly bolters blazing, chainswords hacking stories, which is great, but I felt needed balancing by one that had a more thoughtful pace, with less fighting. One of the aspects of the Heresy I’ve liked the most has been the dichotomy between a growing secular empire butting heads with humanity’s urge to worship things in the sky. I saw this story as a challenge to myself, the readers and to BL. Would I be able to write a story like this that was exciting and engaging? Would the readers buy into it or would they be bored without the action? Would BL publish a story like this? Turns out that it seems all three were answered with a resounding yes. There’s a lot of me in this story, though I’m certainly not preaching to anyone with it. It’s more like I wanted people to talk about the story, to ask themselves questions and look at things in a different light. Some folk have said that Uriah is a straw man, and that the arguments made on both sides of his and Revelation’s debate are simplistic. Part of me agrees with that, as I’m not a theologian (and, crucially, neither was Uriah. He was a drunken rake, called to be a priest by a personal experience. No years of training in a seminary for him…) and I wasn’t trying to write a treatise on religion or belief, but rather a story that got people talking and entertained them. It’s also the first time the Big E turns up in a Heresy story in any real form. He’s appeared a few times to deliver the odd line of dialogue, but this was the first time we’d seen him talk, interact and appear for any length of time (even though most of it is in another guise) so I needed to be careful. In the end, to really stir the pot, I wanted to end the story in a way that, while Uriah might have been wrong, he was the one you liked better and who came out with the apparent moral high ground. The Emperor was right, yet he came across as the arrogant, short-sighted tyrant – the very kind he rails against in the story. Now go back and read it again and see if you agree!